We continue to introduce you to the Latin American routes for terminating voice traffic, which deserve your attention. In Honduras, transit operators pay about $0.06- $0.09 per minute for the final termination of calls. At the same time, the country has a well-developed mobile sector as the penetration rate of cellular communications is 99%, with a population of 9.3 million people. These are excellent preconditions for starting your VoIP termination business. Honduras is considered one of the poorest countries in Central America, which affected the telecommunications market. The country has the lowest level of development of the fixed-line sector, especially in rural areas. But these factors have had a positive impact on the cellular communications market. In the sector, there is a lively competition, which is supplemented by international investments. As a result, Honduras provides the highest mobile penetration among the countries of Central America. Honducel (the market share is about 10%). Previously, Digicel Honduras used to operate in Honduras but in 2012, it merged with Claro. As of 2017, the leader in the mobile sector is Tigo, with the other two operators competing actively with it. The approximate cost of in Honduras is $2. To buy a SIM-card in a network store, you need to show your passport but you can purchase a prepaid starter package from merchants on the street without having to produce any documents. 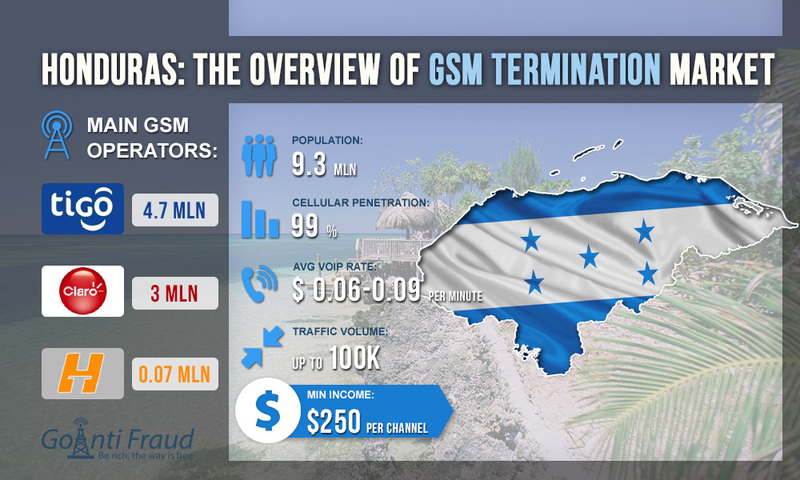 Operators in Honduras, competing with each other, offer advantageous tariffs on calls. There are unlimited packages that provide one minute of a call at a minimum cost. Terminating 5 hours a day, you can earn about $250 via each gsm cellular gateway.